Hey! Today's blogpost is going to be a "What's in my Bag", however it is going to be a school trip edition. I did a school trip edition last year, and I really liked it and it got a lot of views, and I can't really do a normal what's in my bag, because it always changes and never have that much in them. So, I am going on a School trip to France soon and I have started to pack my bag, and I thought I would show you some of the things I am taking with me. This is the bag I am taking with me, just for the bus, not to carry around with me. 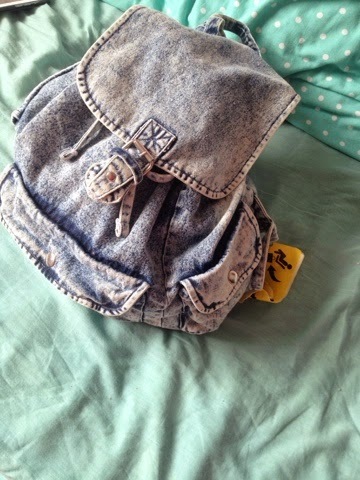 It is this acid washed denim effect back pack, it was from Primark last year and I got it last year for when I went on Holiday. Now, here is what is inside it! Firstly, I have a pair of fluffy socks, I love these and Primark ones for me are always the most fluffy ones, however they have no grip so normally I will fall over in them. 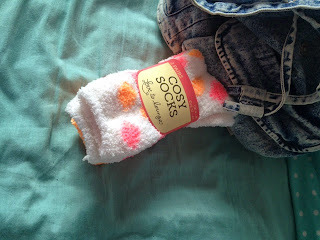 I have them in the bag, as I will be wearing them on the bus. 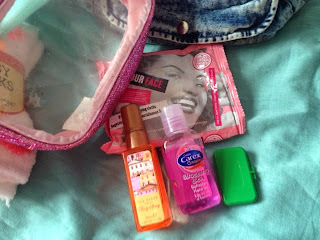 I also have Hand wipes aswell, I always have hand sanitizer with me, so I though as well as that I could also have wipes. This is for if I spill anything or just in case I need them. 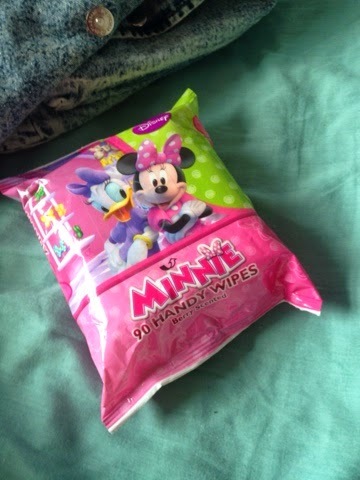 I found these ones in Superdrug, for just £1.29, and I saw they had Minnie Mouse and had to buy them. 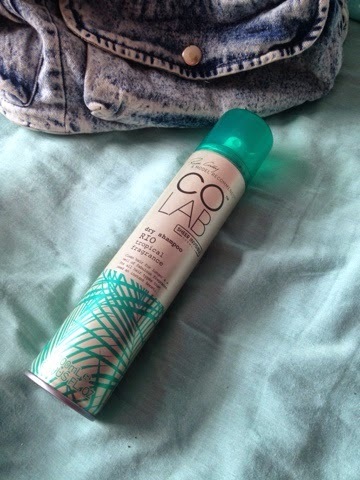 Another thing I have in my bag is, the COLAB dry shampoo in Rio, I don't normally use dry shampoo, as I don't really like it, but I thought I would take some just in case, and the only dry shampoo I like is the COLAB ones. Face mask. 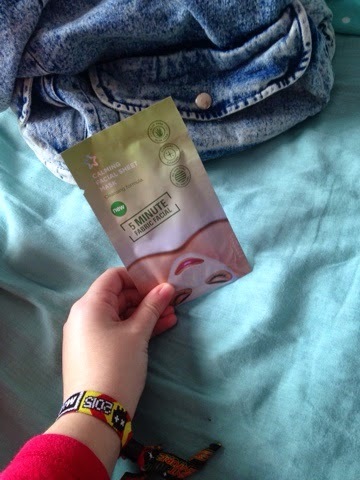 I know a face mask is not the best thing to take on a school trip, but it is one of the fabric ace masks, and the reason I have it is because... Amber and I are going to be using these on the way to waste time. 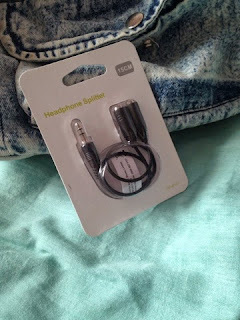 Head phone splitter, again these are for me and Amber to use on the way there. As we are going to be watching stuff on m ipad to again waste time. 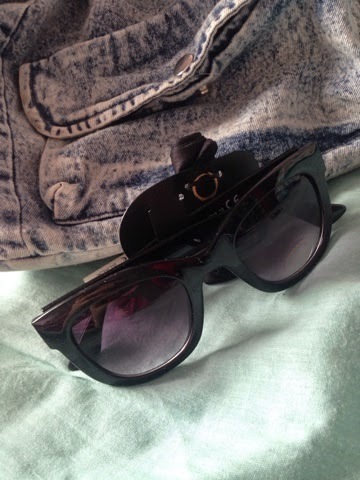 I am also taking Sunglasses in my bag, though it is predicted to rain the days we are in France.These sunglasses were from Primark, like the ones I got the other week. The reason I got another pair of sunglasses was because, I really wanted cat eye sunglasses, but didn't know if they would look nice on me, so just got small cat eye ones for cheap in Primark. 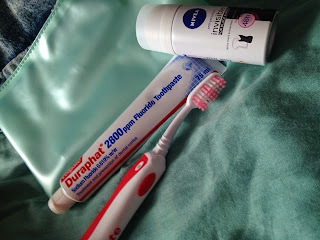 In my bag, I am also taking a small bag with toothpaste, my toothbrush and a small deodorant, I am taking these in my bag because, we are going early in the morning and I will be getting read in service stations and on the ferry, so since I cannot take my suitcase out with me, I can just put everything I need in my bag. I am taking another small bag with me, this one I nearly always have in my school bag, so inside it has makeup wipes (that I hardly use), hand sanitizer, a body spray and wax for my braces, that I always have on me, but never use. The final thing I have in my bag is, my make up. 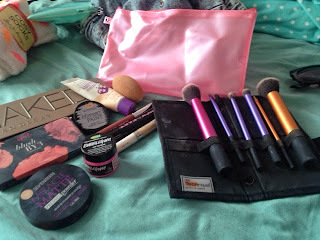 I am taking with me, my foundation, concealer, powder, my naked two pallet, my blush by 3 pallet, and some lip glosses and also my favourite Real Technique brushes. That is all I have in my bag at the moment. However, I will have a change of clothes in there, my ipad, some plug adapters, and my portable charger. That's so cool that you take school trips to France. Every year in my Upper School, I go on a singer's trip to someplace. In the states, our trips are usually to other states. But next year I get to go to Europe on a trip. Are you taking a bus to France? Don't forget to take a lot of pictures and post them on here!